Would the Hulk gain from a Crackerjack Jack attack? I really enjoyed Thor:Ragnarok last week and a lot of that was invested in those Hulk or Banner moments, but ... and you knew there had to be one ... but, it kind of bugged me that the movie hijacked Planet Hulk. I mean, that could have been a movie in its own right. Couldn’t it? There’s a perception that Hulk doesn’t do well when he isn’t playing with others. Old Jade-Jaws has had a chequered past on the big screen. Two solo movies have had mixed receptions, although both pop up on television with alarming frequency for films that attract such distaste. Mark Ruffalo has bucked that trend to an extent but has yet to make the jump to his own movie. But, there’s another one, couldn’t we grease the wheels with a trick Stan Lee used and mix in a form that Disney is more than familiar with? If you remember, when The Incredible Hulk was introduced in 1962, the Grey-Green Goliath had his own comic cancelled after a measly six issues. But Stan Lee persisted. The Jolly Green Giant made guest appearances in Spider-Man and The Fantastic Four. He became a founder member of The Avengers and then made a return to his own series in 1964, sharing Tales to Astonish with Giant-Man. Lee rebuilt the misunderstood monster until he became a viable feature once more. Thee’s a parallel with Ruffalo’s appearances in The Avengers, movies, Iron Man 3 and now Thor:Ragnarok. It’s building an audience for the Hulk. But then again, don’t you just love those short films Disney adds to some features, often Pixar? The Paperman, Jackelope, or Jack Jack Attack which accompanies The Incredibles like some pirate chartered accountant. There is an elegance with Jack Jack Attack in the way it dovetails the parent movie, but the other Pixar shorts are equally beguiling. So what if Marvel movies came with a Hulk short, a tale to astonish, to whet appetites before the main attraction? 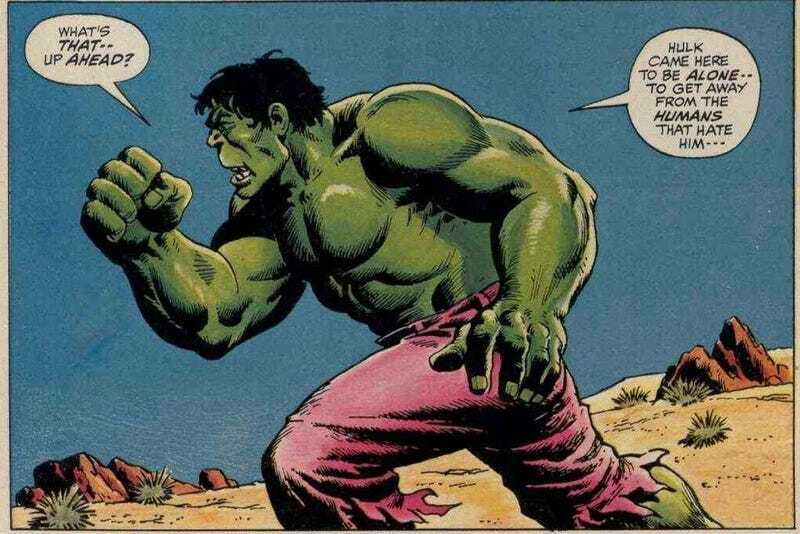 What if they adapted that Thomas-Trimpe-Severin tale where the Hulk wanders through a friendly town in the middle of the baking desert, only to hit a wall of despair when he realises it is a hallucination? Or Crackerjack Jackson teaching the Hulk how to eat beans before it all goes south? That tale with the blind girl? Captain Omen locking his son out as the ship sinks? A fight with the Absorbing Man? or The Glob? Mr Fix-It? Shooter’s YMCA scene? Maybe not? What if they built up a library of short form Hulk encounters? And when they’ve got people talking, that’s when you go for the big guns blazing Jarella epic (guest-starring Captain America, because you want that Eddison and Ellison link to play with).? Or is there something else you would put in the frame?